TRUE BLOOD: Deep, blood red lips are HOT for Fall 2014. Go BOLD with a rich, creamy lipstick, or tip toe into the trend with a sheer, red finish. With so many shades, there’s a red out there for every customer. SMOLDERING COLOR: Sultry, smokey eyes bring on the drama like nothing else. This season, the classic smoldering look gets a colorful new twist. Rich hues of blue, green, and purple, as well as dark, metallic formulas, give the smokey eye a fresh feel. BREATHTAKING BROWS: Polished and beautifully defined eyebrows reigned supreme on the runways for Fall 2014. The look is shaped, without losing fullness, and filled in to add extra impact-stop in to our salon to learn how! For the rest of July $15 for a brow wax and complimentary wonder brow application. Call 630-587-0111 to make an appointment. 3. The obvious Fill in Brow: These are brows filled in or elongated with the wrong-colored powder or pencil, or brows that look like makeup, not hair. Most women go too dark, which makes the brows look heavy, artificial, and blocklike, or use straight strokes that look like they’re drawn on. THE FIX: use a powder or pencil at least a few shades lighter than the color of your hair and apply in small strokes to mimic hair and give a 3-D effect. 2. The “Surprised” Look: Round brows that are semicircles with no arch. They make a woman look like she’s constantly in a state of surprise. THE FIX: While they grow out, tweeze only the “homeless” strays that are way below your brows or edging toward your temples. 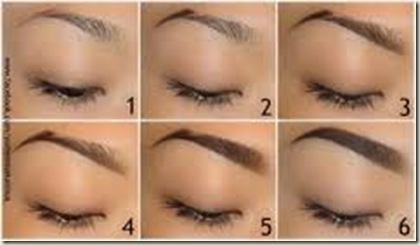 Use a brow powder to fill in sparse areas as brows grow back. 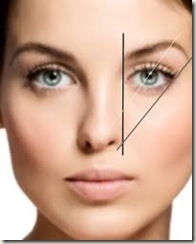 To reshape them, the pro will re-create an arch for you and lift the ends up instead of down. 1. 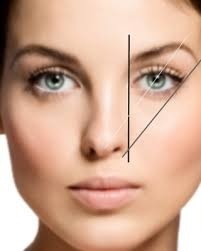 The “Anorexic” Brow: Brows that are too thin don’t do their job- which is to frame your face and accent your eyes-or so painfully thin they look obviously plucked. THE FIX: Fill them in lightly and slightly while you let them grow; but often brows that have been plucked again and again never do grow out. Beverly Hills celebrity dermatologist Boris Zaks says using Latisse grows brows too, though it’s not approved by the FDA for this purpose. Ask your dermatologist.